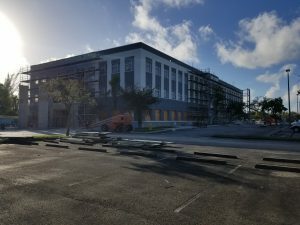 1801 W. Sample Road – Commercial Builders, Inc.
Commercial Builders, Inc. has been selected by Bernal Construction of Miami to complete the complete re-skin of the 1801 W. Sample Road project in Deerfield Beach, Fl. The projects consists of new light gauge framing, USG Securock sheathing and over 40,000 sq. ft. of Parex Watermaster Class PB EIFS system over new sheathing and the existing prepared substrate. Our expertise in this area of construction was a determining factor in being awarded this project.